You Chew What? You Chewbacca! 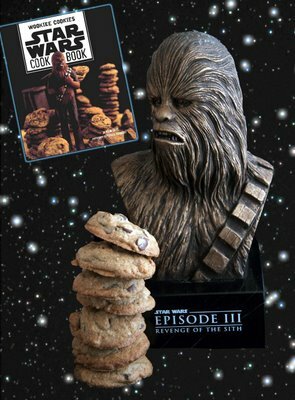 You Chew Wookie Cookies? Please note, these three items will all be shipped separately, to one address chosen by our lucky winner. There will be no guarantee the cookies will arrive in their best state, or even make it through customs, but a devious attempt will be made to at least try and get them abroad, if necessary. Please tell all your non-foodie Star Wars fan friends about the chance to win this once-in-a-lifetime unique prize and help us raise as much money for the United Nations World Food Programme as possible. Thank you. Donate here using Prize Code UW24. Check back here at Becks & Posh in several hours time to see a mystery-roundup of all the incredible prizes donated by US West Coast Bloggers for Menu for Hope III. I would imagine this would be very popular for collectors if you can spread the word wide enough. This is hilarious and sooooo cool...I submitted it to Boing Boing and Neatorama. Maybe you'll get a mention?